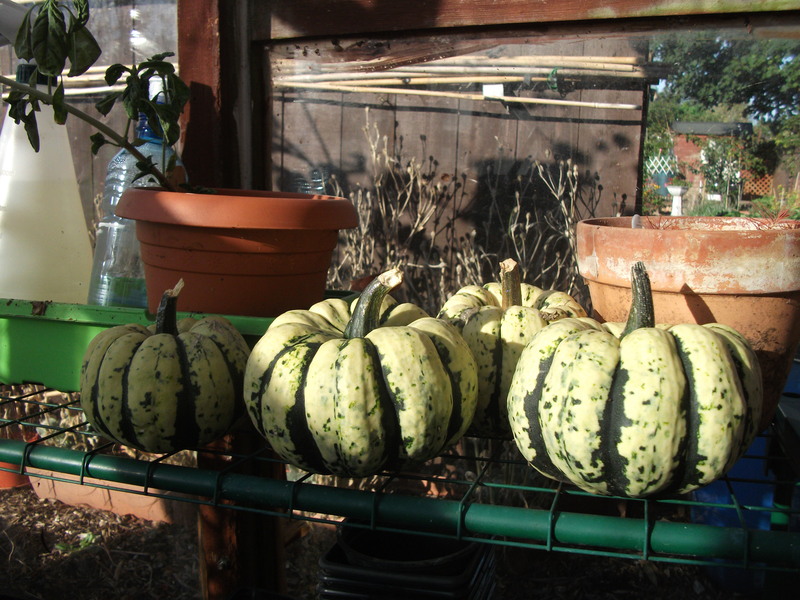 Before I had an allotment, I had only taken notice of the seasons in a commercial way. September would come and that would mean buying for the significant number of birthdays in my family that stretch through October/November, or looking forward to Halloween,bonfire night fireworks and the first Christmas toy adverts on TV. They were all numbers on the clock leading up to midnight on News Years Eve. But now, I have an appreciation of what the season really mean to me. 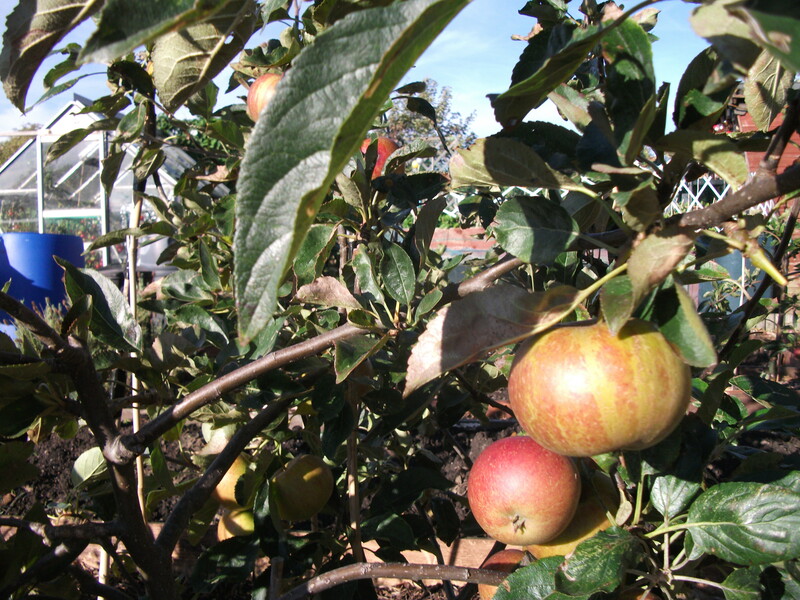 Autumn isn’t just a miserable precursor to Christmas, its when we begin to harvest our apples,pears, squashes and pumpkins. Our Autumn veggies of red cabbages,savoy and Cauliflower (very wee this year!) all have had their netting removed and are brought home to be eaten or passed on to friends and family. The glasshouse feels empty, devoid of the tomatoes,aubergines and cucumbers that fight for the hot sunlight each summer. 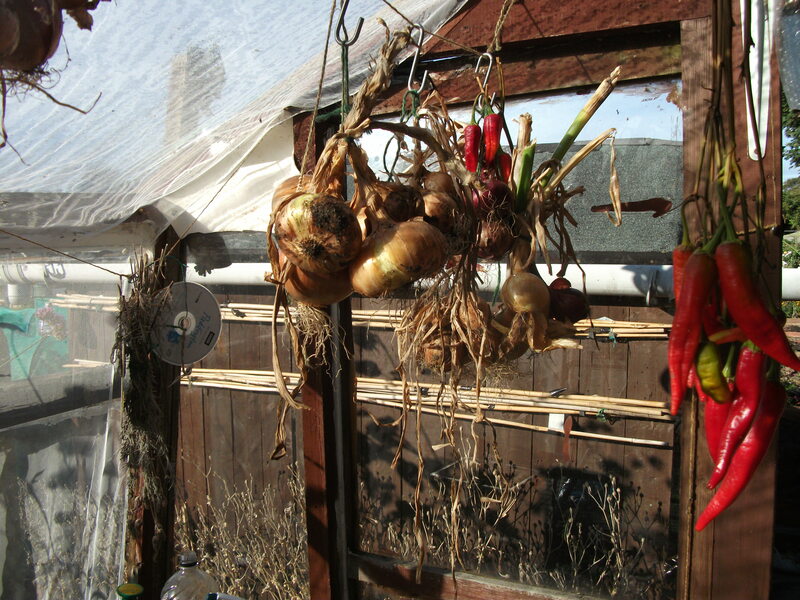 Instead there are garlands of onions and drying cayenne chilli peppers hanging from improvised hooks or the string that criss-crosses above my head. The air is different, it seems clearer despite the bonfires that many of the allotmenters have. Its fresher, there is a bite to it and you begin to notice how you need to wear your gloves not just for collecting fallen leaves to make mulch,but to keep your finger tips warm and moving! Tentatively we prune our fruit trees, asking the same questions every year; Are we doing this right? Should we be doing this now? What if we kill the tree? Every year the same, and every year the trees bloom and fruit. 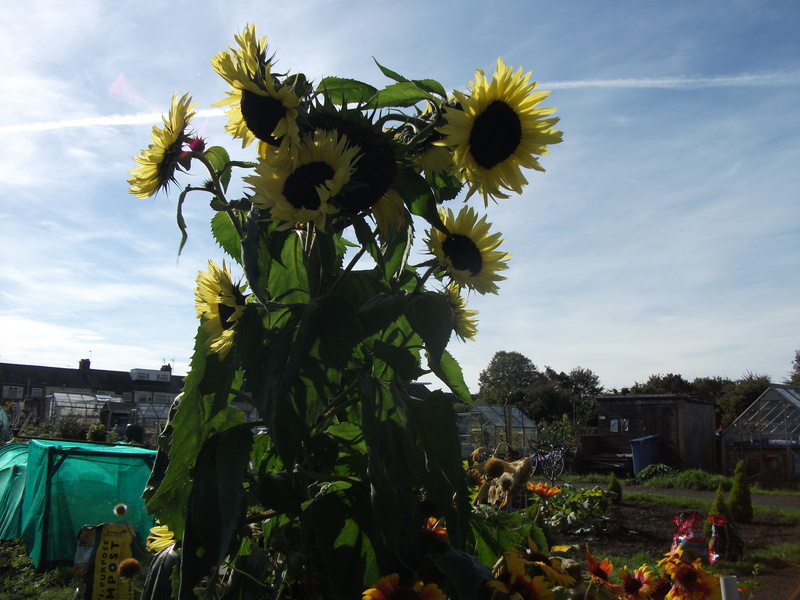 Autumn on our little allotment allows me thinking time. I am putting the beds ‘to sleep’ until Spring and bringing the frost sensitive plants indoors. The winding down allows for maintenance and planning. The end of summer, with its hectic, noisy fastness, for me, brings a peacefulness and a chance to appreciate Autumn’s changes…although I have already planted some broad beans for next year! When you have an allotment you always have a beady eye on what the following seasons will bring.